Being a parent is more than just providing the necessities, managing chores, teaching manners, and setting up consequences for rules that aren’t followed. In order to cultivate a close parent-child relationship, we must set aside intentional, one-on-one time with them. 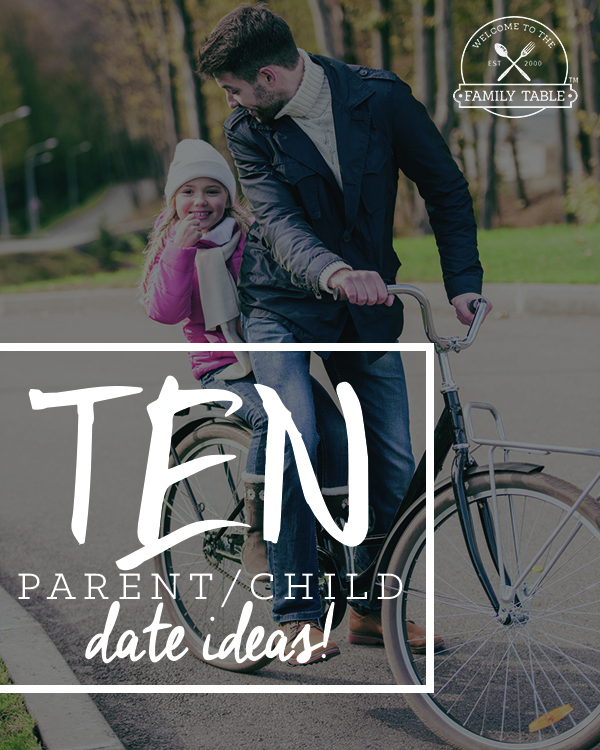 While this may be an adjustment for some, as you work towards putting some of these parent-child date ideas into place, you will see just how important it is to spend quality time with your child on a regular basis. Go out to Breakfast – hop on over to the local breakfast diner with your child and enjoy a fun breakfast date. It’s amazing what a meal together alone with your child can do for their heart! Go for a Nature Walk – grab a jacket and get outside with your child as you embark on a nature walk date. Walking is not only good for your health, but it does wonders for bonding with your precious child. Go to the Mall – take your child out to the mall, but don’t buy anything, just enjoy window shopping and chatting about what your child likes. This is a great time to dream together and talk about things that you may not usually chat about. Surprise Lunch Date – nothing is better than a surprise and a surprise lunch date with Mom or Dad is even better! This always brings a big smile to our children’s faces. Special Indoor Campout Night – consider having a special indoor camp night with your child without electronics. These nights are full of fun, laughter, and deep connection. Sneak out Before Everyone Wakes Up – take your child out to get a special breakfast treat before anyone else wakes up. This not only adds an element of fun, but there is also something so peaceful and calming about being out and and about when everyone else is asleep. Take a Bike Ride – this is a great way to get some exercise while enjoying bonding moments over an activity you both enjoy. We love to go to a local bike riding trail and just chat as we ride. And sometimes it is a fun way to have some friendly competition. We love finding frugal family activities to get the blood pumping and take the family bonding up a notch! Go to the Movies – if your child is all about the movies but you rarely go, take them out on a special date to the movies as a surprise! We go all out when we do — popcorn, candy, and maybe even a soda! Do Origami – this is a fun thing that most of us did when we were younger, look up neat origami projects and enjoy that together. There are so many great origami books out there that give easy to understand instructions and projects. Visit the Library – while you may have to be quiet in the library, they have many parent/child events go attend one with your child. There are so many ways you can get out and enjoy a date with your child, the key is to really think about activities they would enjoy and feel comfortable to open up to you. After all the main point to starting a date with your child is to solidify the bond as parent and child so they will forever feel loved, safe and trusted with you regardless of anything else that happens in life. To be sure that these dates actually happen, write them down on your calendar and hold yourself accountable. Life can wait — but we only have a short time with our children before they head off into the world. Let’s use that time wisely and be good managers of their hearts and our connection with them.